Good day to you all!! Once again, it’s Hazel, all the way from Sunny South Africa to share my latest craft room inspiration. I sew a lot …………………….. actually, I sew more than I scrap / cook / work in my garden. Before I start on a new sewing project, it takes me least 2 days to gather supplies. OK, I do live down under BUT my biggest dream and heart’s desire is to sew away with everything I need on hand. And I stumbled upon the perfect solution …………………………. 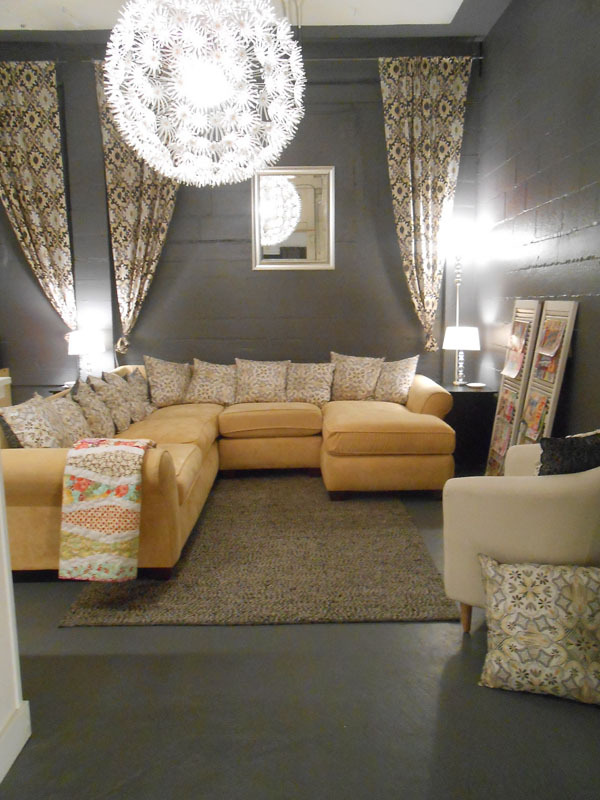 the West Seattle Fabric Company. 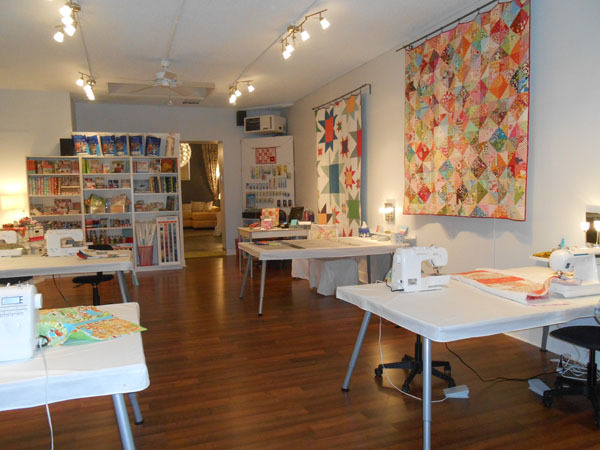 They are a neighborhood fabric store and quilt shop that is a creative haven for experienced and novice sewing enthusiasts alike. Best part is: they have what I call a “sewing studio” where you can sew to your heart’s content, all the supplies, inspiration and advice are on hand and you can even leave your unfinished projects right there. Get something to drink, sit back and enjoy the tour. 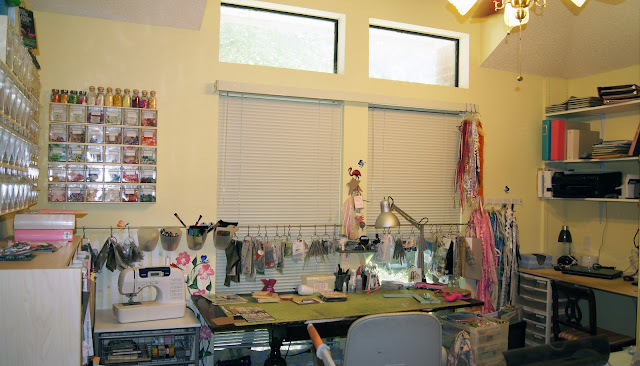 I’ve been to a few “sewing studios” and they are mostly bland and uninspiring. Not this one!! Calm, serene with just the right amount of color and inspiration to get the creative juices flowing. This is their “Notions Wall” where you can grab whatever you need without running from shop to shop to gather supplies. Remember the “boxes” for unfinished projects I talked about? Members can work on their projects and leave them in these adorable decorative boxes until they come back to finish them. 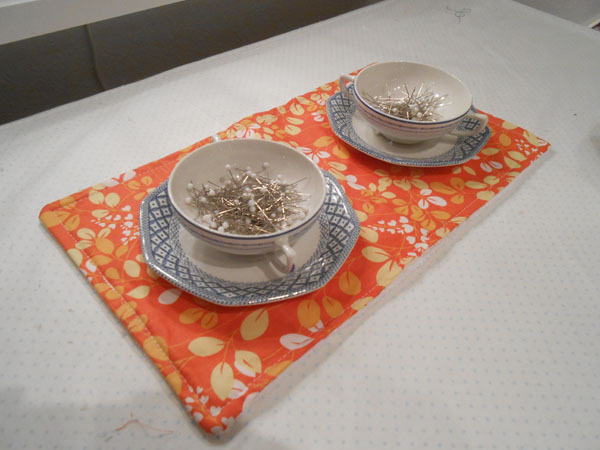 Each Station has an array of supplies available to the sewists – these little pin cups are SO adorable. The Back ‘Stitching Lounge’ is great for hand sewing but it also doubles as a gathering space for baby showers, birthday parties and ladies nights. What more can a girl wish for? I’ve shown you a few of my favorite pics but there are LOTS more in the original post. Just click here to be redirected to Craftaholics Anonymous to see for yourself. While hopping around, visit the West Seattle Fabric Company here. Now for the surprise!! Monica from West Seattle Fabric Company emailed me to let us know that they are moving their studio to the same space as their retail location and (drum roll!!!) 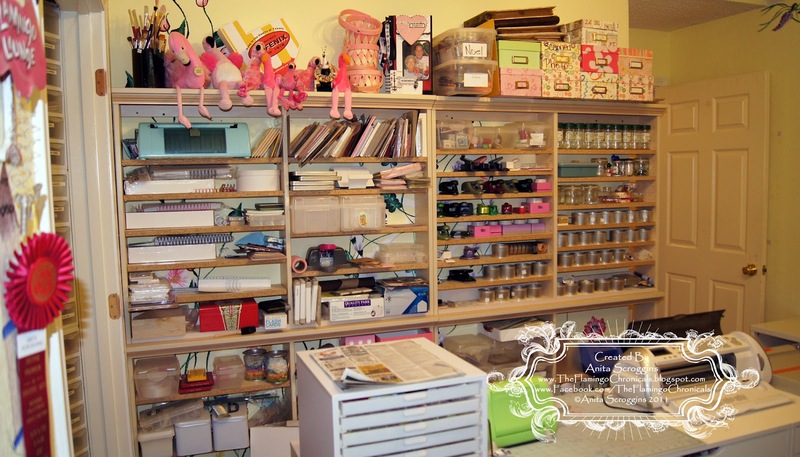 she will send us pics of the new space to share with you right here on Craft Storage Ideas. I’m in total awe of their space, their products and their friendliness. Once again, on behalf on myself and Craft Storage Ideas I want to thank Monica and West Seattle Fabric Company for sharing with us. Thanks for joining me today. I’ll be back with some more craft storage ideas. Just check back and all will be revealed. Good morning to all my fellow craft storage enthusiasts. Once again, it’s Hazel all the way from Sunny South Africa with you today. This is my first post for 2014 and I would like to wish you a happy and prosperous New Year. We are already in Week 2 ………………… if you haven’t started on your New Year’s resolutions, now is the time!! Talking about resolutions, if you haven’t fixed up your craft space, join me in a tour all the way to Germany to see Carola’s Boxwood Cottage Studio. Just the motivation you need to get going. And if that weren’t enough – we’ve got a giveaway at the end of this post that can help you get organized!! Seatbelts fastened? Here we go. And this is her white table. She has 3 more tables in her creative space and this one is used when she has friends over. Hop over to her blog where she tells all about it. Like me, Carola is a collector of all things beautiful and “vintagey”. I love how she used the suitcases for extra studio storage. And why not use your chandelier to show off another collection? I have to confess, I used pictures from two of Carola’s posts. I just loved the detail SO much. Here is the link to her 2011 post and here you can find the 2013 one. There is a health warning on these posts: the pictures are SERIOUSLY beautiful and addictive and I counted more than 50 of them!! Get a cup of tea, sit back and ENJOY!! Before I go, I want to thank Carola for sharing her Boxwood Cottage studio with us. 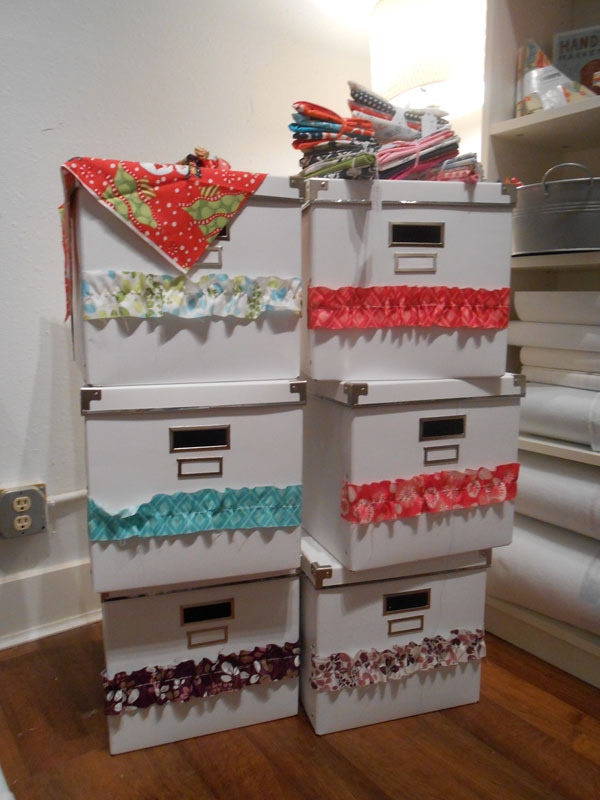 Hop over to her blog and leave a comment to tell her that Craft Storage Ideas sent you. While there, remember to check her Christmas décor posts as well ………………. it’s beautiful! That’s it from me. I’m off to my Craft Closet to do some serious vintage storage. 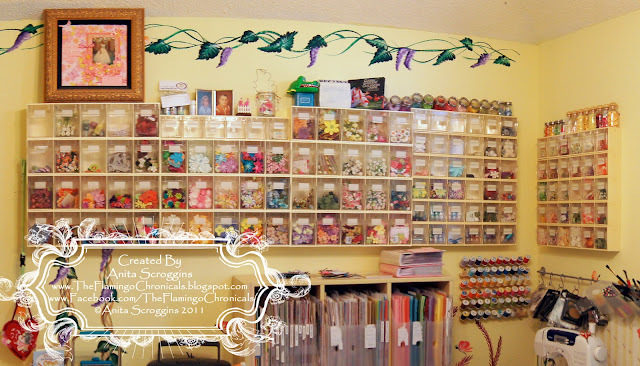 Thanks for visiting the Craft Storage Ideas blog today and please leave me a comment – I love to hear and see what you think and do. And OH, before I forget …………………………….. let me know how many collections you spied in Carola’s Boxwood Cottage Studio – we will have a guessing game and then ask her for an answer afterwards. Come on, join in the fun! 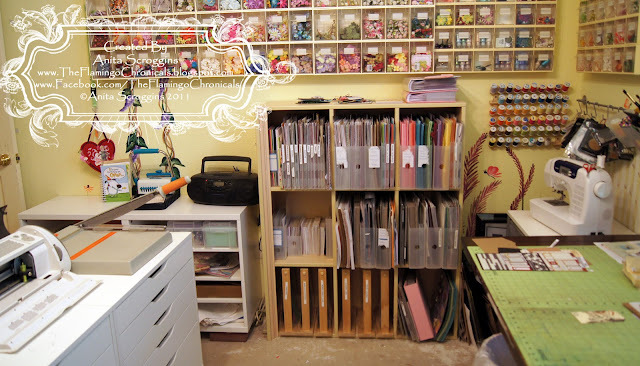 Need a little help organizing your craft space? We are excited to giveaway one (1) seat to the Big Picture Scrapbooking Workshop called “Organizing Fundamentals”. 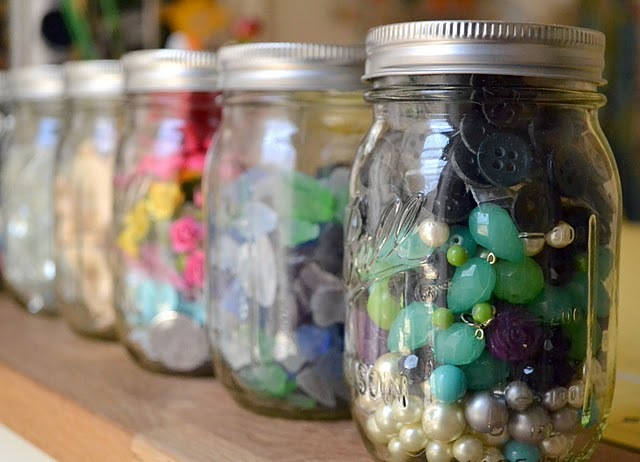 Do you spend more time collecting than crafting? More energy searching through supplies than actually scrapbooking? Then it’s high time you cleared out that clutter, streamlined your stash, and put a tried-and-true organization process to work in your workspace! 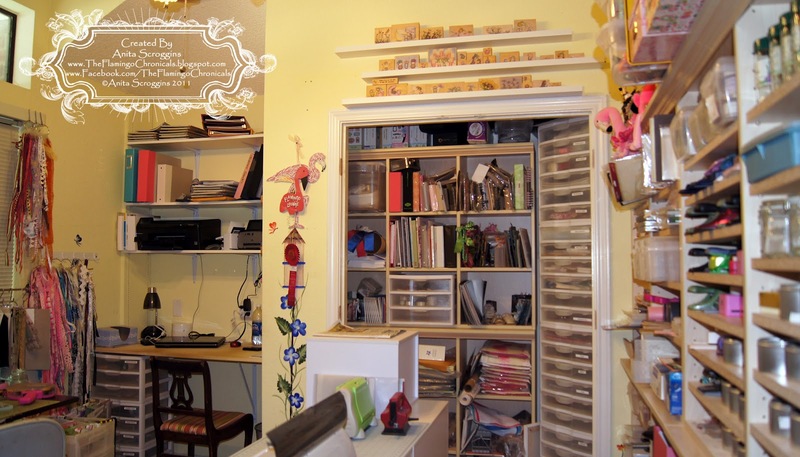 Whether you have a closet or a craft room, Organizing FUNdamentals will help you take control of your stuff and transform your space into an organized haven where you know what you have and can actually use it. In six stash-busting weeks, instructors Wendy Smedley and Aly Dosdall will walk you through their proven organizing process step-by-step, sharing helpful handouts, printable questionnaires, case studies, video chats, and more. 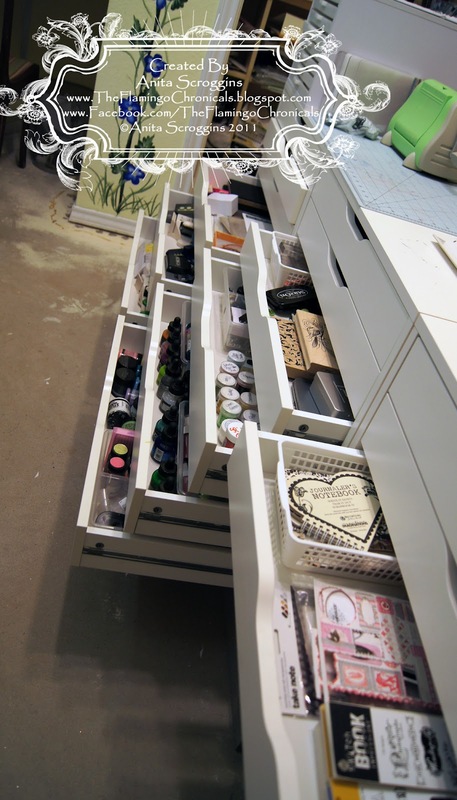 Apply this process to your creative space or any other cluttered, confusing, and stress-inducing area in your home. Bonus: If you’ll stay engaged and motivated through all six weeks of class, you’ll be rewarded not only with a fun and functional creative space, but also with a top-secret incentive that your instructors have lined up for you and will reveal on the first day of class. Organization awaits! Want a chance to win? Just comment on this post with what part of organizing your craft space is the most fun! We will announce the winner on Wednesday! I have been a long time reader of Ashley over at Little Miss Momma. She is very heartfelt and real and if you haven’t been over to her blog, I highly recommend you give it a read. Today, I am here to share a little bit about her crafting space. She has since moved, but this space is too fun and inspiring not to share! I love the neutral with all of the bursts of color. Rooms like this make me want to keep my walls white or a light neutral color to allow all my other craft elements in the room take center stage. She made the cute pennant banner. I love how all the colors in the banner tie in all the colors displayed in the room. I love the color of her sewing desk. I think this has got to be my favorite color right now. And I love the fun fabric on the chair! She painted the desk and recovered the chair. She is no stranger to organization. I love the mason jars filled with supplies. They are on display, contained and make beautiful room decor. You definitely want to head over to Little Miss Momma to see the whole room. It really is an inspiring place to see. When I started out on my journey with Craft Storage Ideas, I was terrified of the idea of putting up a craft studio review every second week but now I can’t tear myself away from them and believe me – you find these little gems in the most unexpected places! Once again, it’s Hazel from Sunny SA and today we are having a look at what Jenny B Harris did to make her crafting environment beautiful and fun. She is known to me as Jenny Allsorts and I’ve been browsing her Etsy shop for some time. I just knew that behind digital papers like these, would be a colorful person (and crafting studio). I told you, that the colors are beautiful! I would just die for a table like this. Even the vintage dresser looks hip, modern with a colorful twist. Jenny is and illustrator, designer and in general an artsy, crafty person. She loves all things stitchy, papery and vintage and she made sure she has a space designated to do them all. Even her computer and work space is in the same room and close to all her colorful inspiration and ideas. I think what makes it all work is the combo of vintage, wood, modern and pops of color. Please hop over to Jenny’s blog and shop to see for yourself how beautiful her stuff is. Thanks for joining me today. Please check back as my fellow contributors and I have lots more craft storage ideas to share with you right here. Hallo to all of you. It’s Hazel from Sunny South Africa and here to share my Craft Closet with you. 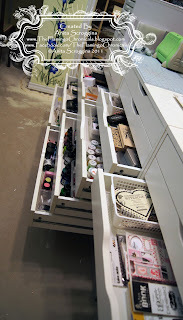 I’m not a curious person and normally I wouldn’t put something like this on my blog but part of being a contributor at Craft Storage Ideas is to share your space (and systems and ideas) so here we go! Who would mind the size of the room if this is the view over the park that greets you every time you walk into it? This is a view of my scrap space. I have two of the same desks – they started out in life as changing tables for my (now) 25 year old son, then my husband used them in his home office and when he upgraded to a full scale office, I snitched them. That’s the only thing I did to my room – painted everything with leftover paint in pretty ice cream colors. On the ends of the desks I’ve got fabric bags – in them goes all my scissors, measuring tapes, rulers – you name it – I have it on hand. And my sewing corner. I try not to move my sewing machines around so most of my sewing gets done here. 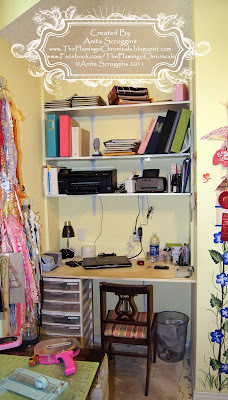 Above my sewing desk are all my sewing goodies. I use these plastic tubs all around my house – the pantry, bathroom, garage, office, etc. No, I don’t like plastic but I hate dusting and we don’t get nice wire baskets down here. 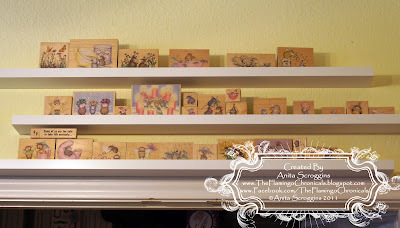 The little drawers on the bottom shelve houses all my different threads and to the right the punched out shapes that I use for packaging. It is much easier storing scraps like this and you are much more likely to use them if they are pre cut. These two drawers came from my father’s desk. When they downsized the desk was shortened to fit into their spare bedroom as a dressing table and I snitched the drawers. I use them in craft exhibitions – just take them off the wall, use and afterwards they go back. Girlfriend #1 (the interior designer) didn’t want me to paint them but they just looked too drab and dingy so out came the paint brush. You can see – I left the fronts and the handles intact to humor her. A while ago I shared with you a cutting table made out of storage cubbies. Well, this is my take on it. I used crates that we normally use in the winery. My husband secured them together with cable ties and added the wheels. I made jackets for my trolleys – in the pockets is magnetic sheets so that my nestable dies stick to the outside. I love this as I roll the trolleys around to where I am and everything is available at a glance. My inspiration board. A painted garden trellis. This comes off the wall for craft fairs as well. This is on the shelf when you enter my craft closet. The old sewing machine was a pressie from Girlfriend #1, the windmill was my son’s from days gone by and on the far end you can see the patterns that I’m currently using. Last of all – I also utilized the ceiling space. There is a condude running all the way around the room and I used trouser hangers to hang my items for craft fairs up there. Packed and ready for shipment and I can see what I’ve got at a glance. You will notice that I don’t have a computer in my craft closet. My husband and I both work from home and we have a separate office (just off the open living space) where all the computers and printers are. Everything is on a wireless network which means that I can work on my laptop anywhere in the house and my photo’s print on the office printers. Works very well for me. That’s it – it’s small but it’s all mine. I hope you have enjoyed your tour of my craft closet. I’ve never shared this on my blog but plan to do so while I have all these beautiful pictures. You are welcome to follow along as I reveal where everything goes and how I did it. I’ll link them all up to one post – just a click away and all will be revealed. Just click here. Thanks for coming to Craft Storage Ideas today. Me and my fellow contributors love to have you over. If you want to know something, please let me know in the comments and I’ll gladly answer. Have a great day and please check back to see what’s interesting or new on the storage scene. Hello everyone, and welcome to my my little slice of heaven! I am very fortunate to have one of the spare rooms in our home to use for my crafty endeavors! Over the years, as my obsession with scrapbooking has grown, so has my collection of craft supplies. Like many of you, my first “major” scrapbook purchase was a Crop In Style wheeled tote. As you can guess, it didn’t take long at all to outgrow it and to start longing for my own little scrappy space. My first dedicated area was a corner desk in our tiny den. You can see that I made sure to make the most of every square inch of space!!! Once my oldest son graduated and moved out, I was able to take over his bedroom and convert it to my craft room. We had allowed him to paint the walls a dark blue, and I decided to go with it, rather than repaint. I was too excited to have my own room to wait a second longer to get everything set up! Fortunately, I had white furniture, so it brightened things up a bit! Over the next few years, this room was arranged and rearranged as my craft and scrapbook collection grew. As I’ve mentioned before, I have an addiction to all things storage, and I’ve tried just about every type of storage product that’s ever been created! Fortunately, some of the local scrapbook stores in my area started having “garage sales,” and I’ve been able to purge supplies and storage products along the way – otherwise, I would need my own scrapbook HOUSE!!! Speaking of house, a little over a year ago, we moved to another home in our same area. We love our new place, especially because it has an amazing floor plan, one that allows my husband to have his own study/office, and I get to have my scrap room downstairs, and in an area of the house that is away from the main living areas. Knowing we were going to be moving gave me the perfect opportunity to be thinking about setting up a craft room “from the ground up.” I spent a lot of time, checking out craft spaces on CSI and Google, coming up with ideas that would work with my existing furniture. Even though it’s been tweaked a time or two since we first moved in, here is my (I think!) amazing craft room! The photo above is taken from the doorway looking in. 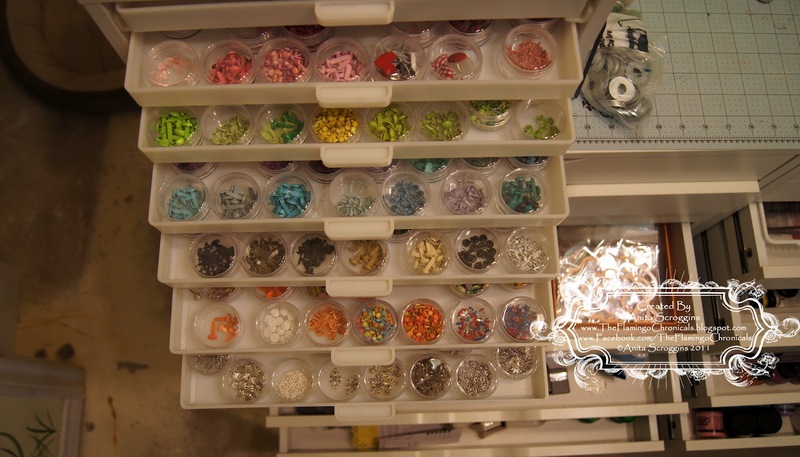 You can check out my posts on using the Jetmax/Recollections “cubes” and accessories from Michael’s, and for modifying their embellishment shelves to allow for extra stamp storage, to get more information on how most of my storage is set up. Believe it or not, that’s still my original corner desk! A few months ago, I decided I wanted to raise the height of the desk, which I accomplished by purchasing two 3-shelf and 1 corner shelf closet organizers from Lowe’s and just sat the existing desk on top! Sometimes, I even amaze myself with my crafty ideas!!! Of course, that meant I had to get my hands on an office chair that would sit high enough to work with the “new” desk! Fortunately, I found one on Craig’s List, that I was able to cover with cute zebra print fabric from Hobby Lobby. LOVE IT! This is a close up of my latest revamp. 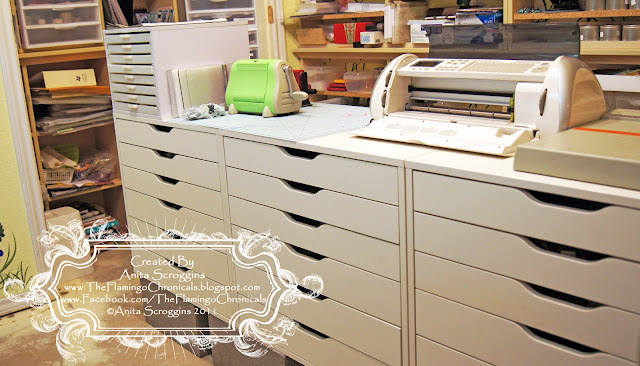 Previously, my electronic cutter station was the Deluxe Craft Table from Michael’s (of course!). Because I am one of those crafters who has to have all their supplies visible and handy, much of my horizontal workspace is limited. I found myself moving things from place to place, even using my paper cutter in my lap, just to be able to work on a project. Obviously, this created more frustration than creative juices, so something had to give! I took drug my hubby with me to Home Depot, where the helpful men in the orange vests were willing to cut a piece of laminated MDF board down to 4 ft. by 6 ft. section for me. They also sell this stripping you “iron on” the cut edges, so you end up with a nice, finished piece of table top! I simply sat it on top of the Deluxe Craft Table, added the extras you see here, and I’m good to go! Ahhhhh! So nice to be able to spread out and CREATE! VINYL!!! Yep, this is my vinyl collection, neatly stored in this hanging storage rack from Bed, Bath and Beyond. I started out with the adhesive craft vinyl, which is on the left side, but decided to use some of the iron-on vinyl to make some baby “onesies” – yeah, big mistake! Now I have to have every color and pattern out there!!! I gotta say, I am having so much fun with it all, and the Cameo makes coming up with designs and cutting them a breeze!!! 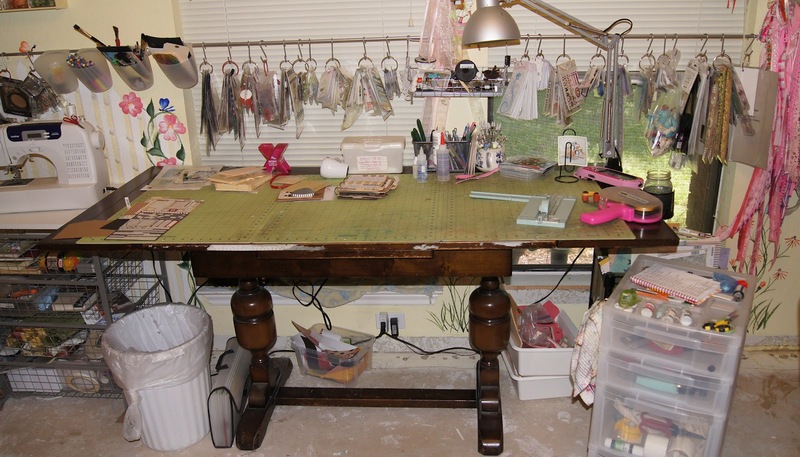 And, finally, here’s my sewing table. On the right are my mason jars filled with buttons. On the left are my containers and drawers with embellishments. The spinning rack on top is from Hobby Lobby and has most of my alphabet sticker sets and miscellaneous stickers clipped on it. The shelf above is my collection of silk flowers, separated by color. The top shelf holds my cork board and my flat screen television. 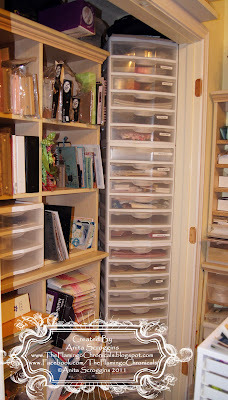 What a terrible job I have, searching through hundreds of photos of craft rooms to find to bring to you! Ha ha! Sometimes, I don’t know how I am able to narrow it down to just one! However, when I came across this pretty craft room from The 36th Avenue, I knew it as the one I would want to share with you today! I just love the soft color palette of the beige’s and white’s, with the pops of red here and there. 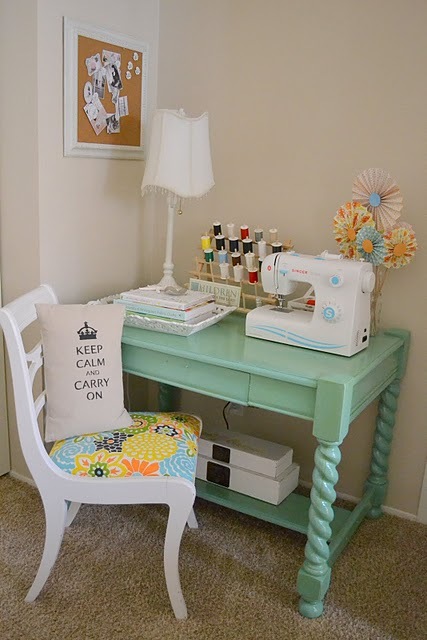 This looks like a cozy spot to sit and sew up some fun projects, don’t you think? Especially with all your tools hanging right there on your cute pegboard! 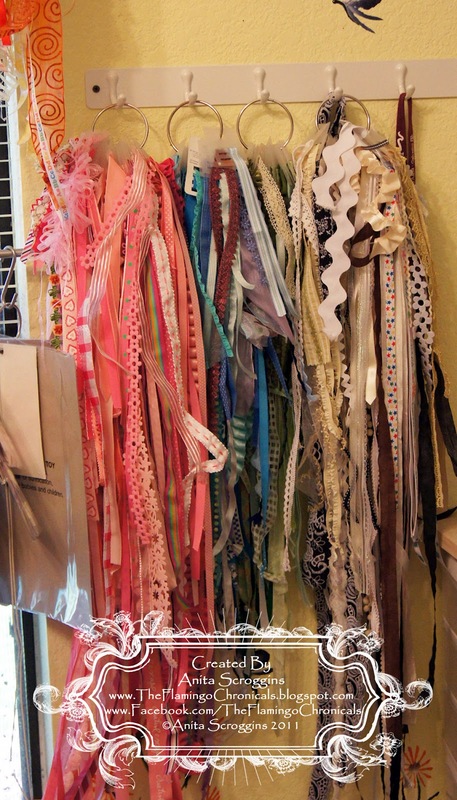 And how about this idea for storing and displaying your Washi tape collection? Hmmm…now where did my old cup tree go??? This dresser-turned-storage-cabinet looks awesome against the adorable polka dot wall! Just look at all the supplies it will hold! Is this window topper not the cutest thing ever??? I love how it adds just the right amount of color and design, while still allowing the natural light to shine on in. Here’s another little peek around the room. Be sure to go to The 36th Avenue to check out all of the photos that Desiree has posted about her craft room. Not only will you get to see even more amazing shots of her beautiful room, she even links you back to some of the projects she’s created so you can make them too! I hope you enjoyed today’s craft room tour. The next room I’ll be featuring will be my own! I’m so excited to show it to you, but I have a lot (a LOT) of work to do on it between now and then! As this is my last post until January, I want to take this opportunity thank you for allowing me to have a small part in your crafty life, and to wish you and your families a very Merry Christmas and a Happy New Year! 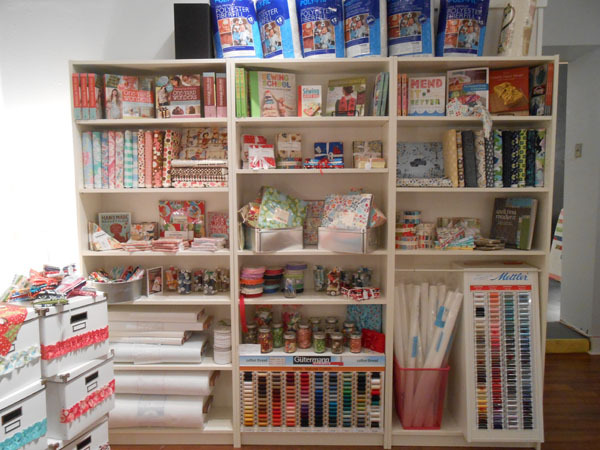 So here is a look at my craft space! I am very lucky to have my own room, outfitted exactly like I want it. I ripped all the flooring out and I have bare cement floors. I didn’t want to worry about what I might get on it. And let me tell you, I have dumped some things on it! And let me say thank you so much to my wonderful hubby who lets me buy and do whatever I want. Love you, honey! Here’s my work table. It is an antique trestle table I bought for next to nothing a few years ago. I have my little rolling cart with all my most used tools on/in it. The rods across the windows are Ikea curtain rods and S-hooks. I keep all the embellies that I reach for the most on those. My sewing machine is to the left on an Ikea drawer unit. Next up is my Ribbon Ring – this is the best organizational tool I have ever bought. It is worth every cent and then some. I love it. My desk has my laptop, printer, photo printer, album in progress and a few misc things. All of the walls in this room have handpainted murals (this used to be DD2’s bedroom when we first moved into this house). Here I have stacked my Iris carts next to some cubicle shelving I have. In the Iris drawers, I sort things I am collecting for future projects. One drawer is all Texas stuff, one drawer is all my DD’s High School stuff, one is all the cards my DH has ever given me, etc. This is my wall of shelves. I keep all my lesser used supplies here. These were stamp shelves in a retail store in their previous life. When the company decided to get rid of them, they came home with me. They are so happy here in their retirement years. No obnoxious children hanging or climbing on them! This is the newest addition to the room – I wanted something to keep my Cinch out on – I use it all the time. So off to Ikea I went. This little thing was so cheap. And very sturdy. Right now it has some things I got at convention on it, but it will have some baskets on the shelves to hold my Cinch supplies very soon. So this is my happy place – my PRIMA BREEDING PROGRAM. Someday, the world might run out of Prima flowers. If that ever happens, I plan on having enough of them in captivity to start breeding my own. Here is my paper storage, another shelf just like the ones in the closet. It had a former life in a retail store as well. It is perfect for storing my paper in! I love, love, love my Alex drawer units from Ikea. There are three of them here, sitting so happily side by side. They come with casters, but I wanted a little more height for mine, so I took the casters off and put cinder blocks under them instead. They are the perfect height now, I just turn my chair around and there they are! I keep tons of things in the drawers, my most used stamps, my inks, die cutting supplies, embellishments,button jars, all my paints and sprays, my punches… so many things. Last, but not least, is by brad storage. I have issues with brads and buttons. I love this little cube, I bought it from Best Scrapbook Shelf, and it is wonderful to store my brads in. It holds HUNDREDS of different little containers of brads. So that is it! My scrappy space. I hope you have enjoyed a look around my studio. I’m going to let the pictures of this fabulous craft room speak for me. Custom built table with tons of storage and room for friends! Wowsa. Seriously, there is so much inspiration in this room. I particularly love the bookcase – which was made from Target bookshelves and molding to make them look more substantial. 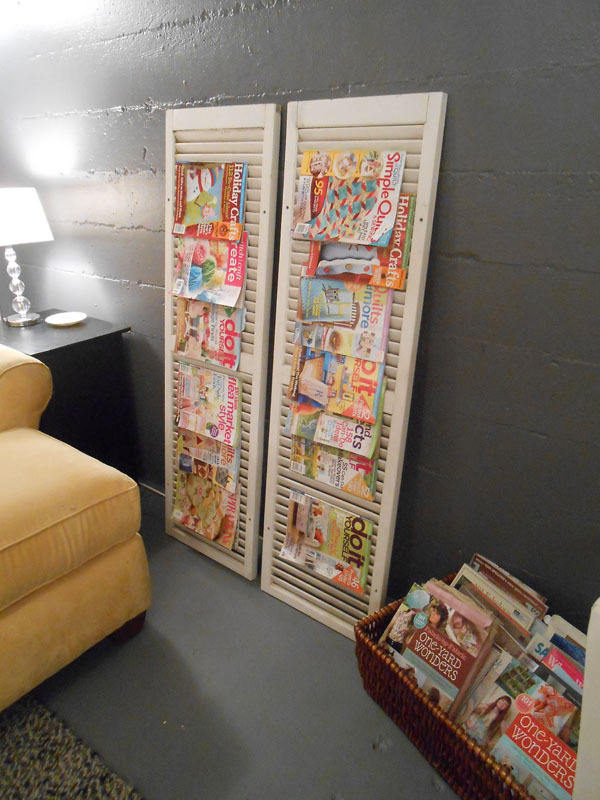 And the brown paper covered magazine holders make everything look cohesive! 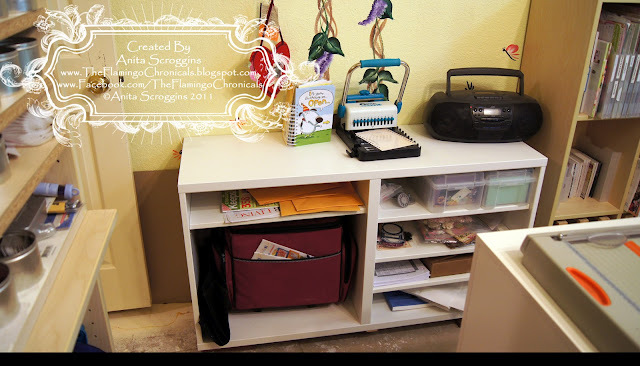 To see more of this room and read the details, visit Jaime at Raising Up Rubies!